This beach ranks #7 of the "Best beaches in Brazil"
There are no hotels near the beach. The nearest hotels are located to the north of the airport. Fly to Brazil to one of airports: Sao Paulo - Guarulhos International Airport (GRU) or Rio de Janeiro International Airport (GIG). 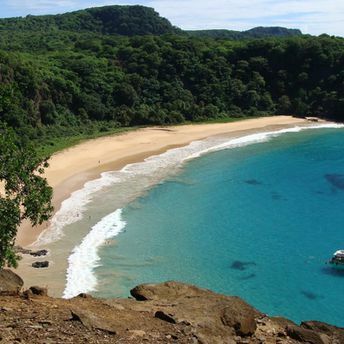 Next fly to Fernando de Noronha Airport (FEN). Next walk, or hire a taxi, or take a boat. Any time, except for the April, as it is the rainiest month of the year.